This week’s wearable is by Sally Spackman, a recent graduate from Massey University’s fashion design degree. 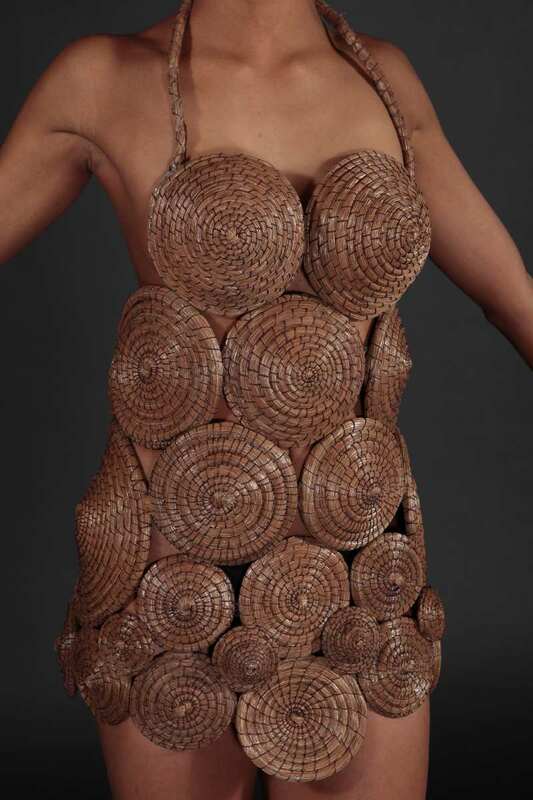 Made from hundreds, if not thousands of coiled pine needles, the spiralled forms that make up Powelliphanta Pine are inspired by the beautiful shells of New Zealand’s powelliphanta snails – the ‘giants of the snail world’. Powelliphanta Pine by Sally Spackman, 2012. World of WearableArt. Powelliphanta snails, of which there are several species, can grow up to 90 mm across the shell – that is much bigger than your average garden snail -, and can weigh as much as a female tui, and live for up to 20 years. Powelliphanta hochstetteri hochstetteri. Department of Conservation. Their patterned shells come in a wide range of colours, from a beautiful golden yellow, to various shades of red and brown, and even black. 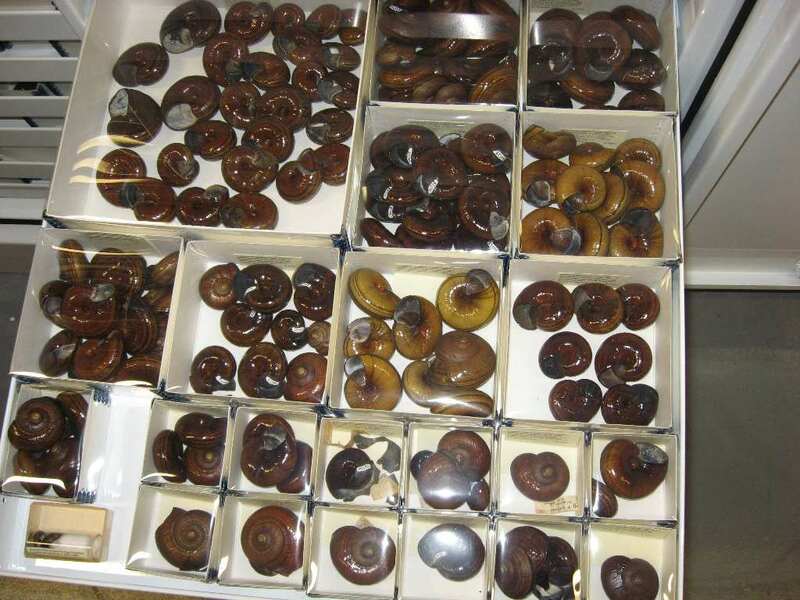 A drawer of powelliphanta shells from Te Papa’s natural history collection. Note the range of shades and colours. Photo: Te Papa. 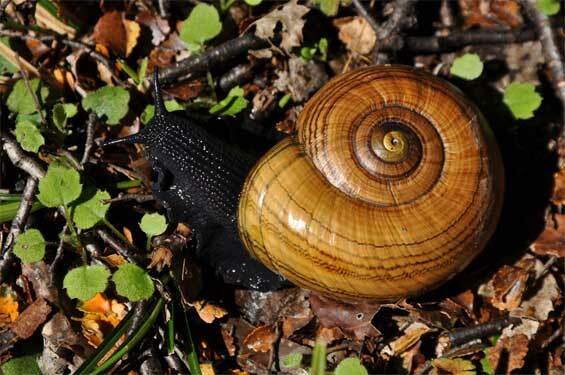 While most of us associate snails with silver trails and holey lettuces, New Zealand’s powelliphanta snails are more than a cut above the average garden snail. In fact their status is that of a national treasure rather than a pest. The Department of Conservation describes them as being ‘as representative of New Zealand’s unique evolutionary history as the kakapo, moa or kiwi’. Te Papa holds thousands of examples of this very special genus of snail. The shells are housed in boxes made of archival material which are designed to buffer the specimens from any sudden change in humidity or temperature should there be a power failure – powelliphanta shells can actually explode if the temperature or humidity rises! The shells are part of Te Papa’s Mollusca collection, which is the museum’s second largest collection after photography and our largest natural history collection. The collection is looked after by Dr Bruce Marshall, who in his career has described and named an incredible 451 new species! The actual genus of Powelliphanta is named after another museum scientist, Dr A.W.B. Powell, who worked at Auckland Museum during the 1930s and 1940s.